This is a current lawsuit that the Department of Justice is involved it. Two whistleblowers allege that Merck falsified data regarding the efficacy of the MMRII vaccine. The judge dismissed the "motion to dismiss". It is shortsighted and potentially unethical to pass legislation without the verdict of this case. The implication is that vaccine failure not unvaccinated kids are the reason for the outbreaks. 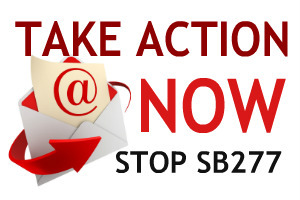 SB277 is an overreach of government. Only 2.54% of Californians have personal exemptions. Those pockets of unvaccinated kids aren't having outbreaks and deaths. Stop using the grandson of a Glaxo Smith Kline's consultant as the poster child of your agenda. Instead consider the children who have been injured by vaccines. Their injuries are real. Parents have the right to be concerned as there have been no long term third party studies of the safety and efficacy of the current cdc schedule in its entirety.